1. Motorola Moto G7 Plus has Chipset of Qualcomm SDM636 Snapdragon 636 (14 nm). 2. Motorola Moto G7 Plus contains Three Network Technology there is GSM / HSPA / LTE. 3. They have contains 3 brands there are 2G bands is GSM 850 / 900 / 1800 / 1900 - SIM 1 & SIM 2 (dual-SIM model only), 3G bands is HSDPA 850 / 900 / 1700(AWS) / 1900 / 2100, 4G Bands is LTE band 1(2100), 2(1900), 3(1800), 4(1700/2100), 5(850), 7(2600), 8(900), 18(800), 19(800), 20(800), 26(850), 28(700), 38(2600), 40(2300), 41(2500). 4. Speed is HSPA 42.2/5.76 Mbps, LTE-A (2CA) Cat13 600/50 Mbps and this modal contains both GPRS and EDGE. 5. They have the dimensions is 157 x 75.3 x 8.3 mm (6.18 x 2.96 x 0.33 in) and weight is 176 g (6.21 oz). 6. Sim Type is Single SIM (Nano-SIM) or Dual SIM (Nano-SIM, dual stand-by) with Splash resistant. 7. Motorola Moto G7 Plus has the display type of LTPS IPS LCD capacitive touchscreen, 16M colors. 8. This model has a size of 6.2 inches, 96.2 cm2 (~81.4% screen-to-body ratio). 9. Motorola Moto G7 Plus has Resolution of 1080 x 2270 pixels, 19:9 ratio (~405 ppi density). 10. Motorola Moto G7 Plus has the OS of Android 9.0 (Pie). 11. CPU Model is Octa-core 1.8 GHz Kryo 260 and GPU is Adreno 509. 13. Motorola Moto G7 Plus has the Main Camera Feature is Dual-LED dual-tone flash, panorama, HDR and Selfie Camera Feature is HDR. 15. Motorola Moto G7 Plus has Active noise cancellation with dedicated mic with Dolby Audio. 16. Motorola Moto G7 Plus has Corning Gorilla Glass 3 and Builds is Front/back glass (Gorilla Glass 3), aluminum frame. 17. Motorola Moto G7 Plus has Sensors are Fingerprint (under display), accelerometer, gyro, proximity, compass. 18. Motorola Moto G7 Plus has contained Both Loudspeaker and Alert types are Vibration; MP3, WAV ringtones but 3.5mm jack is available for this model. 19. USB Port is micro USB 2.0, USB On-The-Go. 20. Bluetooth is 5.0, A2DP, LE, EDR, aptX, and WLAN is Wi-Fi 802.11 a/b/g/n/ac, dual-band, WiFi Direct, hotspot. 21. GPS is available with the type of A-GPS, GLONASS, GALILEO. 22. Battery type is Non-removable Li-Ion 3000 mAh battery with Fast battery charging 27W, Quick Charge 4, USB Power Delivery 3.0. 23. It also contains a Photo/Video editor and Document Viewer. 24. Motorola Moto G7 Plus has the Browser Compatibility is HTML5. 25. Color Variants are Deep Indigo, Viva Red. 26. Motorola Moto G7 Plus will Be Released in 2019, February. Moto G7 Play debuted as Motorola's newest budget smartphone on Thursday, one in every of four new Moto G7-Series smartphones undraped in Brazil - the others being Moto G7, Moto G7 and,and Moto G7 Power. The new Moto G7 model is touted to deliver up to 60 percent faster performance than its predecessor.Also, the Moto G7 Play has options like a conventional show notch and a rear camera with a PDAF (phase detection autofocus) lens.The phone additionally has an octa-core Snapdragon 632 SoC and features a Max Vision HD+ display panel. Thanks to its budget worth, the Moto G7 Play appearance set to contend against the Redmi Note seven and Samsung Galaxy M20. We're here scrutiny specifications and worth of the Moto G7 Play with the Redmi Note seven and therefore the Samsung Galaxy M20 to assist you see the simplest decide for you.To examine the opposite Moto G7-Series launches, cross-check our previous coverage. The Moto G7 Play worth within the North American nation is ready at $199 (roughly Rs. 14,200). 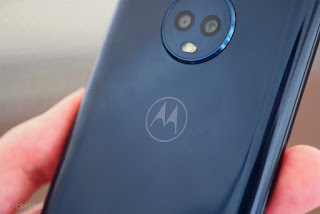 The smartphone will initially be available in Brazil and Mexico, though it will reach Europe later this month and will roll out over the next month in various parts of Latin America and North America.It comes in Deep Indigo, starlike Black, and Fine Gold.Moreover, the Asian country worth and accessibility of the Moto G7 Play ar however to be declared.Distinctly, the Redmi Note seven worth in China starts at CNY 999 (roughly Rs.10,600) for the 3GB RAM/ 32GB storage variant, whereas its 4GB RAM/ 64GB storage model is obtainable at CNY one,199 (roughly Rs. 12,700) and the 6GB RAM/ 64GB storage version at CNY 1,399 (roughly Rs. 14,800).The Smartphone comes in Twilight Gold, Fantasy Blue, and Bright Black shading choices and is right now restricted to the Chinese market.The Samsung Galaxy M20, on the opposite facet, comes at Rs.10,999 for the 3GB RAM/32GB capacity variation, while its 4GB RAM/64GB capacity show is valued at Rs. 12,990.The Samsung phone is ab initio out there in Asian country, although it's set to debut in Republic of Indonesia next week. The dual-SIM (Nano) Moto G7 Play runs humanoid nine Pie out-of-the-box.The Redmi Note seven, on the opposite hand, comes with MIUI supported humanoid oreo cookie.However, the Samsung Galaxy M20 runs Samsung expertise nine.5 wife supported humanoid eight.1 Oreo. Motorola has provided a five.7-inch Max Vision HD+ (720x1512 pixels) display along with a 19:9 aspect ratio.This is in contrast to the Redmi Note seven that contains a half-dozen.3-inch full-HD+ (1080x2340 pixels) LTPS display with a 19.5:9 aspect ratio.The Samsung Galaxy M20 conjointly contains a half-dozen.3-inch full-HD+ (1080x2340 pixels) Infinity-V Display with a 19.5:9 aspect ratio. In the engine, the Moto G7 Play has an octa-center Qualcomm Snapdragon 632 SoC, combined with 2GB of RAM. In distinction, the Redmi Note seven is steam-powered by a two.2GHz, octa-core flower 660 SoC, paired with 3GB, 4GB, and 6GB RAM options.The Galaxy M20 has Associate in Nursing octa-core Exynos 7904 SoC in conjunction with 3GB and 4GB RAM versions.The Moto G7 Play has 32GB of aboard storage that's expandable via microSD card (up to 128GB).This isn't in line with the Redmi Note seven that has 32GB still as 64GB choices in conjunction with a microSD card slot for increasing the storage (up to 256GB).The Galaxy M20 conjointly has 32GB and 64GB storage choices with microSD card support.For photos and videos, the Moto G7 Play contains a single 13-megapixel camera at the rear in conjunction with Associate in Nursing f/2.0 lens and an 8-megapixel selfie camera at the front withan f/2.2 lens.The Redmi Note seven, on the other front, sports a twin camera setup with one 48-megapixel Samsung GM1 sensing element with f/1.8 aperture and another 5-megapixel sensing element. There is conjointly a 13-megapixel selfie camera with options like AI face unlock, AI good beauty, AI single shot blur, front HDR, and background blur among others.However, the Samsung Galaxy M20 has twin rear cameras comprising of a 13-megapixel primary device and a 5-megapixel ultra-wide device, alongside an 8-megapixel camera at the front.Connectivity options on the Moto G7 Play include 4G LTE, Wi-Fi 802.11 a/b/g/n, Bluetooth v4.2, GPS/ A-GPS, USB Type-C, and a 3.5mm headphone jack. The Redmi Note 7 has 4G VoLTE, Wi-Fi 802.11a/b/g/n/ac, Bluetooth v5.0, GPS/ A-GPS, USB Type-C, and a 3.5mm headphone jack.The Samsung Galaxy M20 conjointly offers an identical property expertise through choices like 4G LTE, Wi-Fi, Bluetooth, GPS/ A-GPS, 3.5mm headphone jack, and a USB Type-C port.The Moto G7 packs a three,000mAh battery that supports 10W fast charging through a bundled TurboPower charger.The Redmi Note seven contains a four,000mAh battery along with Quick Charge 4 support.However, the Samsung Galaxy M20 packs a vast, 5,000mAh battery.